Custom Home Builders in Calgary: Consider a Straw House! Custom home builders in Calgary can employ a wide range of techniques to make your new house as comfortable and energy-efficient as possible. 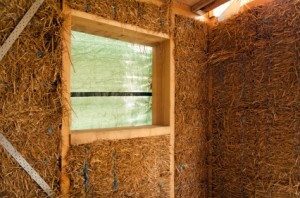 One such technique that has been gaining increased attention of late is the use of straw bale insulation. It is literally possible to build a house with straw, and the benefits of this unique approach to home construction make it well worth considering. The principle of straw bale insulation is simple: instead of building the exterior walls out the traditional combination of lumber, stone/concrete and insulation panels, bales of straw are stacked inside a wooden frame, then covered over with plaster. This technique, which is being used with increasing frequency by custom home builders in Calgary, is structurally sound and also does a great deal to boost year-round comfort and home energy efficiency. It all comes down to a concept known as “R-value.” If you’ve ever purchased insulation, chances are you’ve encountered R-value ratings before. They are a metric that expresses the ability of a given insulator to inhibit thermal transfer, or the passage of heat from one place to another. The higher an insulator’s R-value, the better it resists thermal transfer. In Calgary, many homes have insulation with an R-value of about R-20 in the exterior walls. Once you account for thermal bridging you are at around a real R-value of about 14. Straw bales offer an R-value in the range of R-28, making it up to twice as efficient as conventional insulation. According to some estimates, straw bale insulation holds the potential to reduce your annual home heating costs by as much as 50 per cent. These walls can be used in combination with other thick wall techniques and provide superior insulation, achieving R-values upwards of R-50. Remember, too, that insulation affects your indoor comfort in both winter and summer. In the winter, you’re aiming to keep heat inside your home and preventing it from escaping to the cold outdoors. During the summer, you want to do the opposite and ward off the heat outside to keep the inside of your home cool. Straw bale insulation is one of the absolute best ways to keep your home warmer in winter and cooler in summer while keeping your energy bills as low as possible. You may be concerned that building your home with straw bale insulation creates an increased fire risk, but according to a recent article in the Edmonton Journal, straw bale insulation appears to be just as safe as conventional insulation, if not more so. The article refers to an act of vandalism that occurred during construction of an Alberta couple’s home. In the incident, the vandal placed a lit cigarette in exposed blocks of straw bale insulation, intent on starting a fire. However, no damage occurred, because the tightness of the placement of the bales made combustion impossible. One of the additional benefits of building your walls with straw bales is that they are naturally breathable, which in turn provides added control over indoor humidity levels and fewer problems with indoor condensation, moisture and toxic mould. Finally, you can help the local economy by choosing straw bale insulation. Custom home builders in Calgary source their straw from area farms, putting a product that would otherwise have gone to waste to better use. Also, from an eco-friendly standpoint you can’t get much friendlier! Fine Line Homes is one of the top custom home builders in Calgary. We help people throughout the province realize their home ownership dreams at prices that are more affordable than you might have guessed. In addition to designing strikingly beautiful, impeccably designed homes that leverage the talents of a full range of architectural, engineering, landscaping and interior design professionals, we strive to make every home we build as energy-efficient as possible. This helps you enjoy a superior return on your investment in the form of a higher-than-average resale value, all while keeping operating costs as low as possible. To learn more about our energy-efficient homes, or if you have any questions about our processes, please don’t hesitate to contact us. We’ll be happy to speak to you in detail about your particular needs.